I'm wearing my fave eye products from Motives Cosmetics, as well as Belletto Studio airbrush foundation (check out my current GIVEAWAY to win yours), plus a few goodies from great hair and jewelry companies! Read more for Deets, Tips & Pix! Salut mes belles!! 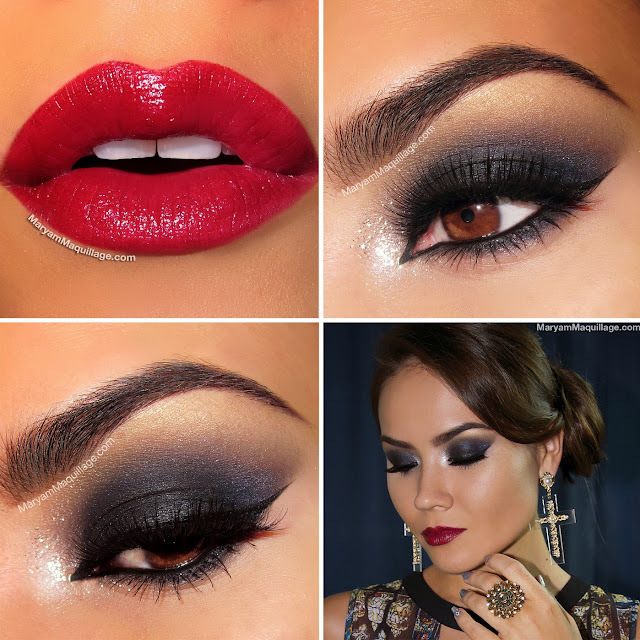 Christmas is almost here and today's SPECIAL serves one of my favorite classic party makeups: a sultry navy smokey eye paired with burgundy lips and edgy accessories for a killer look that's made for a femme fatale! Appropriately, I'm using Missha's Fatal Aura Collection & GIVING AWAY 3 SETS to 3 lucky winners!!! Read more for tips, pix & GIVEAWAY deets!!! Salut mes belles!! Christmas is right around the corner, so today's look is once again reflective of the holiday spirit using green as the quintessential color of Xmas. If you know me and have been following my blog for a while, then you know that green in not typical in my color palette and I only embrace it on special occasions. Today is that day and I'm wearing green proudly, thanks to Motives Cosmetics whose green glitter is the prettiest I've ever laid my eyes on! For this popular look, I'm mixing up a couple of styles, particularly "East meets West" rocking a celeb-inspired fringe and some gorgeous exotic hand-made earrings from my fave Eastern jewelry line Innaya Couture. Read more for deets, tips & more pix! Read more for tips, pics & steals!! Read on for products, tips & Tutorial!